179 (13 June 1944), 181, 182, 183, 184, 185, 187, 188, 189 (22 June 1944). For mission dates and targets see Combat Missions. 2Lt Carlos H. Johns, Jr. (CP)(KIA) - 9 credited missions flown as CoPilot: With 1Lt Dale M. Fisher (8 missions - 181, 182, 183, 184, 185, 187, 188, 189); With 2Lt Paul M. Long (1 mission - 180). 2Lt Carl H. Felton, Jr. (N)(KIA) (*) - 10 credited missions flown: With 1Lt Dale M. Fisher (8 missions - 181, 182, 183, 184, 185, 187, 188, 189); With 1Lt Donald M. Johnson (2 missions - 179, 180). 2Lt Carthel O. Gaskin (B)(KIA) (+) - 8 credited missions flown: With 1Lt Dale M. Fisher (7 missions - 181, 182, 183, 185, 187, 188, 189); With 1Lt Donald M. Johnson (1 mission - 180). Substitute Togglier, S/Sgt Thomas E. Weaver, used by 1Lt Dale M. Fisher on mission #184. T/Sgt John M. King (E)(KIA) (+), T/Sgt Richard H. Johnson (R)(Evadee), S/Sgt Bernard E. McKeever (BTG)(KIA) (+) and S/Sgt Victor P. Crandell (WG)(KIA) - 8 credited missions flown - all with 1Lt Dale M. Fisher (181, 182, 183, 184, 185, 187, 188, 189). No missions with other Pilots. S/Sgt Robert M. Cooper (WG/TG)(KIA) - 7 credited missions flown - all with 1Lt Dale M. Fisher (As Waist Gunner - 181, As Tail Gunner - 183, 184, 185, 187, 188, 189. A substitute Tail Gunner, Sgt Willard F. Moore, used by 1Lt Dale M. Fisher on two missions (181, 182). Sgt Walter F. Moore (TG) - Removed from the 1Lt Dale M. Fisher crew, before the crew flew any combat missions, when the crew size was changed from 10 to 9 men. 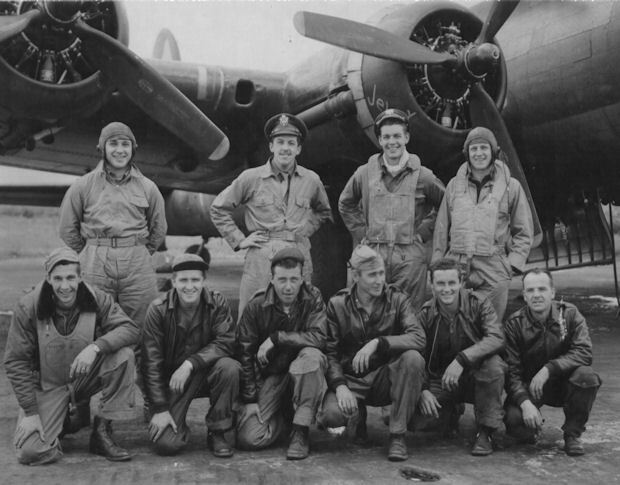 Flew no combat missions with the 303rd BG(H). His reassignment duty is not known. (KIA-EVD) On 22 June 1944 mission #189 to Lille, France in B-17G #43-31432 Old Glory (360BS) PU-N. Received a direct hit from flak just after "bombs away". Hit back of the #3 engine, probably in the gas tank. Immediately burst into flames, spun off to the right and went down. The B-17 crashed at Tressin, France. Only one parachute was spotted (8 KIA & 1 EVD). T/Sgt Robert H. Johnson (R), the only survivor who evaded capture, spent his first two nights in a house in the neighboring village of Anstaing, then was hidden in the home of Mr. George Ormand in nearby Sainghin-en-Melantois, up to 03 September 1944 when the place was liberated by Allied troops. 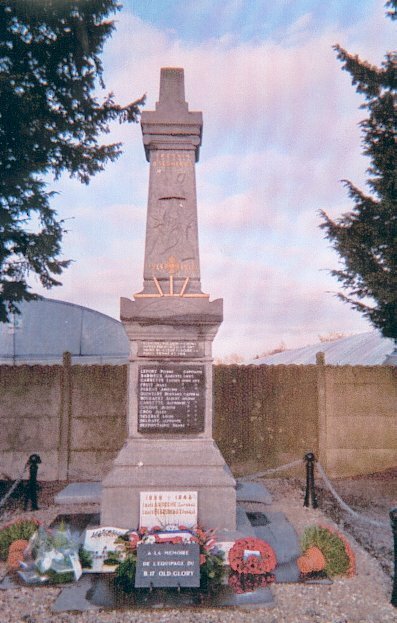 In 1994, a monument was placed in Tressin, France honoring the Old Glory Crew. See photos here. 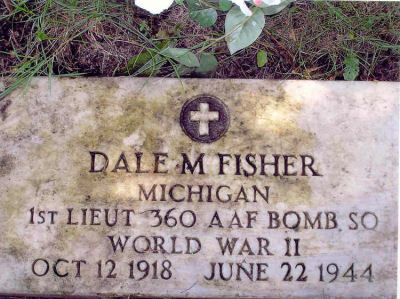 1Lt Dale M. Fisher's original grave marker and his final resting place in Michigan. 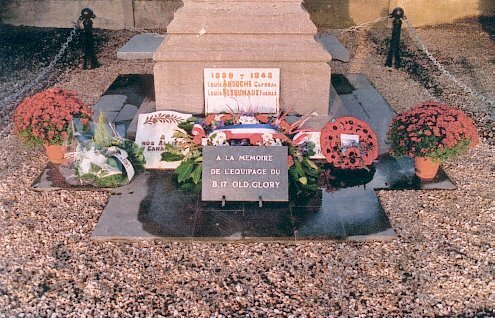 The eight crewmen who were KIA were buried locally in Tressin. The bodies of Felton, Gaskin, King, McKeever and Crandell were transferred in 1945 to the Ardennes American Cemetery in Neuville-en-Condroz. S/Sgt Robert M. Cooper (WG/TG) was reburied in the Beechwoods Cemetery in Jefferson County, PA. 1Lt Dale M. Fisher was reburied in Traverse City, MI. 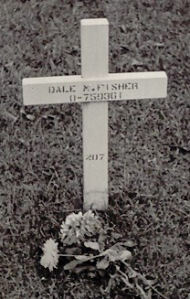 A memorial to the 1Lt Dale M. Fisher Crew was established at Tressin, France. See Memorial photos here and here. Also, see Hell's Angels Newsletter, May 2001, for a story about the sister of 2Lt Cathel O. Gaskin (B), Jane Schauberger, and Nephew of 1Lt Dale M. Fisher (P), Phillip Fisher, who made a Pilgrimage to Molesworth, England and the 22 June 1944 crash site of The Fisher crew B-17 at Tressin, France.